Was supposed to make life better for all, but . . .
Life was worse at the end. The leaders became the same as, or worse than the other farmers (humans) they rebelled against. Was supposed to fix the problems created by the Czar, but . 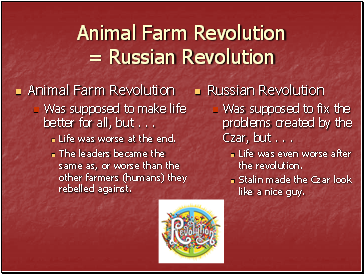 . .
Life was even worse after the revolution. Stalin made the Czar look like a nice guy.